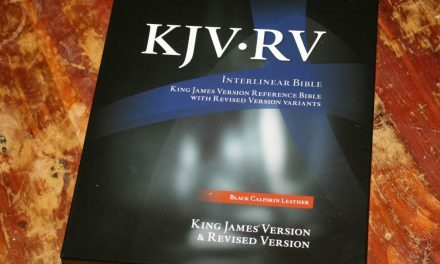 but now with a fresh, new setting of the King James Version Bible. reflections on the Bible, and study group notes. particular words are to be found in the text. Does this happen to be a little smaller than the previous version? I love the layout, but it seemed just too thick to carry around. Thank you. Hi Kenny. This one is thinner than the original. It’s also a different type-set. It matches their large print thinline, though the layout is a little different. I just received the wide-margin this week. I’m planning to post the review next week. Ordered this BIBLE around October 22, received a call it had come in Thursday 10-31, which is good service. The fact it was printed in China was not mentioned on the website, that would have kept me from ordering it? The books of the BIBLE are not separated by starting every book on a new page, I do not like this, and it eliminates additional space to make notes for the books on the remainder of pages at the end of each book . Are no blank pages at the beginning or end of the BIBLE for notes and personal reference? 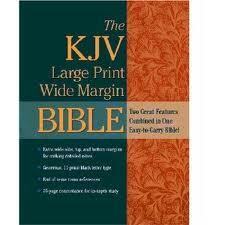 This seems to be a very good BIBLE but a few short cuts to save a dollar or so seems to be a bad decision? Really like the print, especially the 11 pt size. The paper for the pages are good and seems to be of good enough quality. The color of the print looks as if it will be just fine. To have the scripture at the end of each verse is really a good thing, helps and saves time. Last comment is I may return it and mostly due to: printed in China and the fact that each book is not started on a new page. Have not used it as of yet and will keep looking for what I really want and not have second thoughts about it.